If you have germinated other Fuchsia seeds before, you may use the same method that worked for you. The method below has worked for me. Getting started -- Use small containers or cups that have drainage holes. For soil, use a well draining soil mix, such as 2 parts potting soil to 1 part perlite (use small- or medium-grade perlite, not large chunks) or coarse sand. An alternate mix is equal parts of coir fiber and perlite. Don't add lime to the mix. Fill each container with soil, but don't pack it down. Place a seed or 2 on top, and sprinkle a thin layer of soil on top - just enough to barely cover the seeds, to allow some light in, to help germination. Add water until the soil is evenly moist (but not saturated). Until the seeds sprout, ensure that the soil surface does not dry out. If you enclose the pots in a plastic container to maintain moisture, leave it open slightly to allow some fresh air in. Keep the pots between about 65-77 degrees F (18-25°C). A little cooler at night is ok. Avoid letting them get above 80°F (27°C). I recommend placing a minimum/maximum thermometer near the pots. Keep the pots in a bright spot out of direct sun. A bright LED or fluorescent bulb kept a few inches (10 cm) away provides the right amount of light (See: "Growing indoors with LED lights"). The seeds usually begin sprouting within about 4-5 weeks, but sometimes may take up to 10 weeks to start sprouting. If you have more than one seedling in each container, snip off the weaker one(s) after 4 weeks - or carefully transplant it. Give your seedlings bright light, but avoid direct sunlight. I recommend growing them indoors the first few months. Fuchsias don't like dry air. Over about 40-45% humidity is best. If your plants seem to suffer in low humidity indoors, consider using an ultrasonic room humidifier, sold at home improvement stores and some thrift shops. Watering - Fuchsias like evenly moist soil, but it shouldn't be constantly saturated either. Fertilizing -- The first 2 months, feed every 7 days with a small amount of dilute (1/8 strength) liquid fertilizer. Hydroponic fertilizer is ideal for seedlings, because it is easily absorbed and contains all essential nutrients. After 2 months, you may switch to a granular fertilizer that contains micronutrients, following the dosage on the package. Or continue feeding weekly with some liquid fertilizer at 1/8 strength. 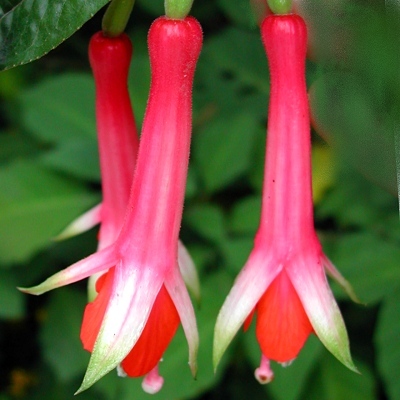 This Fuchsia is a forest plant, so it prefers filtered sunlight or morning sun, with protection from strong afternoon sun. It prefers moderate temperatures and cool nights. It is said to be one of the more heat-resistant Fuchsias, although i don't know if it will thrive if temperatures regularly get above 85 degrees F (29°C), particularly if nights are warm. It is reported to handle down to about 25 degrees F (-4°C), although i recommend protecting it from prolonged frosts. Pests to watch for - Watch for any pests that can affect your other plants.